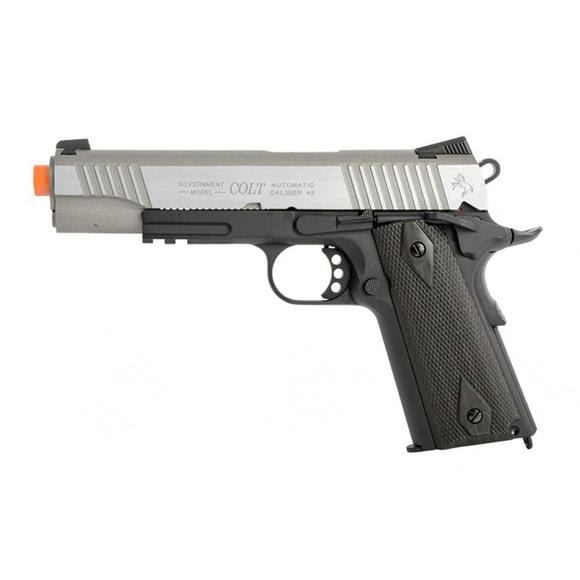 The Colt 1911 Rail is a full metal, CO2 blowback, 6mm airsoft pistol with licensed Colt trade marks. This Palco heavyweight adds durability and offers a realistic feel. The 20mm underside rail is ideal for mounting tactical accessories. A two stage safety operates just like the real steal firearm. The Colt 1911 Rail is a full metal, CO2 blowback, 6mm airsoft pistol with licensed Colt trade marks. This Palco heavyweight adds durability and offers a realistic feel. The 20mm underside rail is ideal for mounting tactical accessories. A two stage safety operates just like the real steal firearm. An adjustable hop-up allows the user to make precise changes to get the most accuracy out of the Colt 1911 Rail.